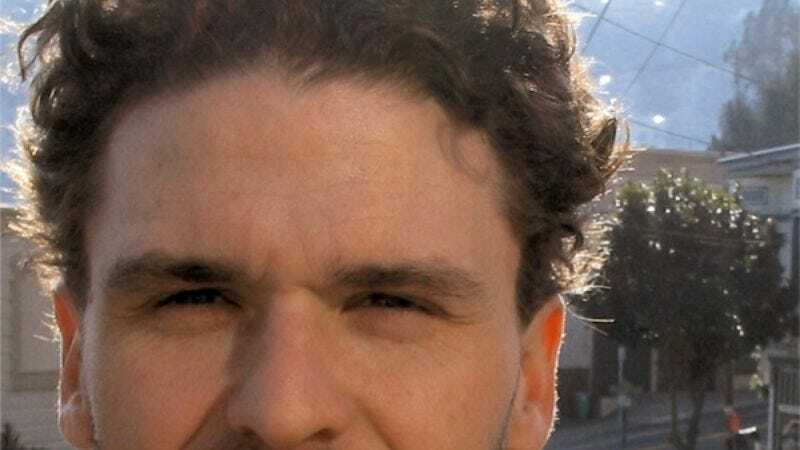 Once, Dave Eggers was a well-kept secret, known primarily to the small fan base devoted to the viciously witty, youth-aimed magazine Might, which Eggers co-founded in his early 20s. But when he published his first book, A Heartbreaking Work Of Staggering Genius, he became an instant literary sensation. The book–an irreverent experimental memoir of how Eggers was orphaned at 21 and left to raise his 8-year-old brother Christopher–became a bestseller and a Pulitzer Prize finalist, while Eggers became the fulcrum of a new postmodern literary movement, centering on his anthology website Timothy McSweeney's Internet Tendency (mcsweeneys.net), his dense literary journal McSweeney's Quarterly Concern, and eventually his publishing company, simply McSweeney's. Eggers only has a few solo books to his name–Heartbreaking Work, the 2003 novel You Shall Know Our Velocity, and the recent short-fiction anthology How We Are Hungry–but he's edited and published fiction and non-fiction through McSweeney's, curated anthologies including the Best American Nonrequired Reading series, and written for a variety of publications, including the monthly McSweeney's magazine The Believer. He's also co-authored two hilarious faux science manuals with his brother Topher–Giraffes? Giraffes! and Your Disgusting Head, both credited to "Dr. & Mr. Haggis-On-Whey." He's founded a free creative-writing center for kids, San Francisco's 826 Valencia program (826valencia.org). And most significantly, he's galvanized the publishing world by creating a unique and tiny startup that consistently follows its own rules about what's publishable, what's marketable, and how the two should work together. Eggers recently spoke to The Onion A.V. Club about the stress of fame, the purpose of literary critics, why he writes and publishes what he writes and publishes, and of course, gorillas. The Onion: When we last tried to schedule an interview with you, right after A Heartbreaking Work Of Staggering Genius was published, you said you were uncomfortable with phone interviews, and didn't have anything more to say about your work. At one point, you agreed to an interview, but only if it was conducted via e-mail, and was entirely about monkeys. Dave Eggers: Oh yeah. I just thought it would be good to talk about—it was a particular kind of monkey, orphaned gorillas, I think, in the Congo, that we were going to talk about. I always like the idea of doing interviews with somebody but completely seriously not ever mentioning what that person is generally known for. Like, I did an interview with [The White Stripes'] Jack White [in The Believer] where we only talked about upholstery. He'd been an upholsterer. We never mentioned music or anything else. Back then, I think I was probably really bored with hearing myself talk about the same things, about the book and all. O: Do you have burning revelations about gorillas that you still need to share? DE: You know, at the time, they were an interest. I was actually just going to study up on them; I wasn't an expert. I don't know. I could bone up and get back to you. O: Are you more comfortable with self-promotion these days? DE: I never said I was uncomfortable with it. When the first book came out, it became really popular really quickly and unexpectedly, and just like anyone else in the history of the world who's been in that position—just having it evolve really quickly—your first reaction, and I think the only really sane reaction, is to pull back a little bit and try to restore your life to normalcy. So for me, that was trying to go back to a quieter kind of existence. No more media for a while, so I could just get my life back to what it was. O: You auditioned to be on The Real World before that book came out. Do you think you would have gone through the same publicity fatigue if you'd gotten on the show? DE: Well, there was never any serious intention to get on the show. It was a bunch of us who decided to audition; a young person can have some very strange, what-the-hell judgment. Nobody was very serious about it. We had the idea of writing this whole account of it, comparing everybody's different stories, but I was the only one who had a funny story, because the rest of them didn't go very far. For [A Heartbreaking Work], it was mostly just background material. O: Do fans pressure you for more autobiographical work so they can get caught up with you and your brother? DE: Yeah, I get that a lot. Usually, people just ask me how Topher's doing, that kind of thing, and it's an incredibly nice feeling to know that people care about how our lives are going. I think, "Great, but there's not much to tell." But I'll never write any more on that. There are short stories, maybe a novel, in my head that go back to the idea of family in a way, but writing autobiographically, I can't get around the fact that it brings out a different kind of writer, a different kind of passion, that's harder to put on the page than when you're writing fiction. O: Has all the attention ever been problematic for Toph? DE: Oh, no. It's something that we always sort of looked out for, but nothing ever happened, so it's never been anything vaguely like a problem. For him, it's just kind of nice. O: What was it like working with him on Giraffes? Giraffes! and Your Disgusting Head? DE: We've always worked on stuff together, even when we never did anything with it, even when he was really young. But it was nice to be able to do that. We're working on one about a giant squid right now. Toph's incredibly funny, and I just like collaborating with him. I've always thought he's funnier than me, and I like batting things back and forth with him. O: One review of Giraffes? Giraffes! hyped it as "a clever, postmodern satire targeting the ponderousness, seriousness, and intellectual pretension of the scientific establishment." Is the philosophy behind those books really that complicated? DE: [Laughs.] Well, that's the job of writing about books, or about art: We sometimes make something out to be more serious than it is. I'm an amateur science enthusiast. I'm not even a professional enthusiast. I don't know anything; I never even passed biology in high school. But I read the science section of the newspaper. I have a friend who sends me the weirdest science stories from around the world. It's always been an interest of mine. So it sort of grew out of that, out of the idea of using that kind of pedantic tone, and always assuming knowledge from people that they shouldn't have, and punishing them if they didn't already know this or that—I think that description is accurate. We almost wrote a mission statement out of it, out of that review. O: Criticism of postmodern books often seems to assume that there's a target, and a significant ironic impact built in. Do you think that's true? DE: You know what's weird? I've purposely stayed away from reading much about postmodern theory, and most everything I have read just bored me to tears. I don't think anybody's written about it, or very few have, with any verve. I've always been interested in the form itself, so I always feel like I've never been good at going ahead with the artifice and not acknowledging the self in the artistic process, and not acknowledging the absurdity of pretending that's required in fiction. I always had a hard time with fiction. It does feel like driving a car in a clown suit. You're going somewhere, but you're in costume, and you're not really fooling anybody. You're the guy in costume, and everybody's supposed to forget that and go along with you. Obviously, it can work, it works all the time—well, it doesn't always work. Still, no matter what, I'm always looking at the form and addressing it, not ignoring it. O: The decision to initially market You Shall Know Our Velocity solely through your website and through independent bookstores caused a significant ripple in the publishing industry. What are your thoughts now about how that situation played out? DE: We thought it was great. I wanted to write and publish a book, but I didn't want any of the hoopla that came with the first book. I didn't do any interviews, but I did tour. I was like, "Is it possible to write a book without everything else that comes with it? Can I just go out and meet my peers, sign books, and go home?" So we printed 50,000 copies and gave them to the independent bookstores that we worked with, to reward the indies and keep the whole process under control. And we think it worked really well. We sold all the copies, and the bookstores were very happy, because it drew in new customers. O: Do you think that you hurt sales in the long run? Would you have sold more copies if you'd gone with the big chains in the first place? O: And that was never a consideration? DE: No, I don't think we even went back to press on it. Well, maybe for a few thousand copies. It melted people's brains at the time, but we really wanted to limit the sales, and I never wanted to be on a bestseller list. When I was on the bestseller list with the first book, everyone who knows me knows that every week it continued to be on the list was a very dark week for me. Everyone knows that all I wanted was to be off that list. DE: Because of everything that comes with it. I never wanted that kind of attention. I'm not good at that kind of thing. I had come from Might magazine, which had 10,000 readers, tops, any given month, and that was very nice and comfortable for me. This sort of mainstream-whatever is really uncomfortable, and I didn't realize what it would do. All I wanted was to return to life before, and it started with getting off that damn list. So with Velocity, we sort of engineered it well so that there was no way that we could get on this list. I know it sounds really weird, because everybody assumes that everybody wants to be a bestseller or whatever. But the way that McSweeney's is run is, "Can there be a way that what they call mid-list authors, people who don't sell in the Danielle Steel category, can still have an audience and still make a living?" McSweeney's has very little overhead, to the degree that we can sell 6,000 copies of somebody's book, and he can still get a decent amount of money, because he's getting more per book because of the low overhead. That's still our goal. I was just sort of going along with the same business model, like, "If we sell 50,000 copies, then everyone will do fine, and life will stay quiet." O: Finances aside, does it concern you that you're limiting access to your art? If all the attention and privacy-invasion wasn't a consideration, if you could have your books in the hands of everyone in America without having everybody in America wanting a piece of you, would you want that? DE: That's a good question. Wow. Boy, you know, I thought about that for a long time. I thought, "What is the tradeoff here?" But I don't think that there's any way to have both, to have my quiet life and have some big professional book out. If I had to choose, I would always choose to have the quiet, non-chaotic life. Because I just barely survived that first time. I really had a hard time dealing with all that stuff. So it would be nice [to have a lot of people reading], and that's why we later did the paperbacks through Vintage, so they could get to more people. They reach bookstores that we can't, really. But it's nice to have things in the family, on a modest scale. O: Your new anthology How We Are Hungry mostly seems to center on isolated, lonely people who are struggling with desire. Is there any particular reason you kept returning to that theme? DE: I would disagree about "isolated" or "lonely." Those are two things that I don't know very well, so I can't write about them. I think that most of the characters are people who aren't settled in what they're doing, and maybe have been uprooted in one way or another, by an event in the world or their own restlessness. Most of them are abroad and looking for something. This is what the hunger is about: whether they're hungry for some kind of affection, or something else. O: "Isolated and lonely" doesn't just mean that they're by themselves. It seems like these characters don't communicate well, and that the theme of desire comes from the theme of being unable to share something important, being unable to externalize something key and internal. DE: Well yeah, that's well-said. I can't improve on that very much. There are certain things that I know run throughout the book, certain things in the way that I chose the order, so it would make sense and develop in a way. Then again, you really don't always see all of the themes yourself. The idea of them having these things inside themselves that they can't share was not necessarily intended, but I like that. O: If you don't know loneliness well enough to write about it, does that imply that you only write what you know well? Do you consider all your work autobiographical in some sense? DE: No, loneliness is just a thing that I'm not personally interested in. So far, it hasn't been on my docket of things to write about. Maybe it will at some point. I'm just saying, I don't think of any of these characters as lonely. But there are emotions in the situations most of them are in that are foreign to me. This isn't the most autobiographical thing that I've done. O: What was the initial intention behind the 826 Valencia program? Why particularly a public writing school for kids? DE: The idea occurred to me in Brooklyn, and it might have started sooner if I had as many friends who were teachers as I have in San Francisco. We were talking about the burdens they have with big classes and not many resources, and how they weren't always able to give every student one-on-one attention. Between that, and living in Brooklyn among a lot of public schools, walking by them and wondering how I might get involved—I always wanted to pop in sometimes and help. There wasn't any sort of program by which I could do that, and so we finally had some meetings and everything, and found a space where we could do what we wanted, which was really connecting the editorial community—authors, journalists, editors, publishers, and everybody—trying to use their expertise to bring the kids up to speed as much as possible. And also, the kids who have skills, and maybe want to learn more about careers—that's where the workshops come in. They're taught mostly by professionals in theater, film, writing, poetry. It serves that purpose of providing an actual drop-in center, which is available for kids that want that extra help. O: Are you interested in expanding the program to other cities? DE: Yeah. I mean, there's one in Brooklyn that opened last spring. And we're getting a space in Los Angeles. There are a lot of other groups across the country that we're either advising or helping directly, and the idea with all of them is to create a tutor core, and help teachers help students with their writing. O: Do projects like this tend to get in the way of your writing and editing? DE: Sometimes, yeah. Sometimes it's hard. Like today, we did a book about teacher salaries that's coming out in a couple of months. So I have to do the corrections today, and Fed Ex them today, but I got a million other things to do. There are times when it is frustrating. The fall is really busy, with school starting, and all the classes, so I didn't really get much writing done for a while, and that's sometimes hard. But what I don't really want to do any more is—there was a while where all I would do was wake up in the morning and write; that was my only responsibility, really. It goes back to loneliness, I guess—not that it was lonely, because I always had a family around and stuff, but I didn't feel connected to anyone in any meaningful way, looking at anyone outside my own family and friends. It didn't feel like I was putting myself to good use. My mom was somebody who helped out a lot at schools, was always in everybody's life, trying to help out any way she could. I think I wanted to have that same thing, I don't know. But yeah, right now there are about a dozen groups around the country that want to start 826-like organizations, and we can't say yes to everybody, because of the work involved. That's frustrating, knowing that these things are needed everywhere, and what a difference they could make, but knowing that you don't have the resources to do it. O: Is the work as satisfying as your more personal, solo artistic projects? Do you feel a sense of responsibility toward it that affects how you choose to allocate your time? DE: I wouldn't be happy just writing short stories, I think. I did feel something was missing for a couple of years there. It was only after the opening of 826 that I went, "Okay, it feels right, it feels balanced." I had a sense of equilibrium for a while, but it's hard, you know. This teacher-salary book was a little bit hard because it's incredibly straightforward, and very informative, I think, but on an artistic level, it's not incredibly groundbreaking. And sometimes for me, that's hard to—or inputting the changes, where I'm at the computer for 12 hours straight. It's not very fulfilling, I guess, but it's necessary. I feel lucky that McSweeney's is doing well enough that we can publish a book like that, whereas someone else might not be able to, and we can put it in the hands of people who wouldn't otherwise pick it up. To be able to have that ability, we can't squander it, we have to treat it with a certain seriousness. Because that responsibility, that trust that people have given us with buying our books, that becomes the tools and platform to try and do something different. O: Was there any particular lack or fault in the publishing world that you were addressing when you founded McSweeney's? DE: No, not really. I think very early on, the first couple of issues of McSweeney's were mostly articles that were killed from other magazines. That was the immediate goal, to put this stuff into print that hadn't been given a chance. After that, for a long time, it was trying to publish the most formally groundbreaking fiction and journalism we could. We were most interested in what you were going to do to advance the form. And we're still interested in that, but somewhere along the way, we expanded the scope of what we publish. A lot of the fiction that we publish now is very traditional and straightforward. We still do find ourselves publishing things that other people have rejected. The only other thing that we did early on was try to bring a sense of humor to the literary establishment. O: Does the goal of experimentation, or the it's-hard-to-say-no philosophy, come into conflict with the urge to create enduring works? Would you prefer to publish something groundbreaking but ephemeral, or something weightier that might become a lasting classic? O: By "our books," do you mean books McSweeney's publishes, or books in American society? DE: Yeah, I mean the English-speaking literary world. If you look at the books that we still remember, that are taught, that are canonical, I think a great percentage of them are formally groundbreaking. The number-one book on everybody's list is Ulysses. This is certainly not a conservative book; this is the wildest, most formally bizarre experiment of its time. There are countless examples of other canonical books that sought first to do something great with the craft. It wasn't enough just to have a great story; James Joyce had to tell it in a way that no one had before. I think right now we're in a time where people don't really have the patience for that kind of thing as much as they once did. As readers, we are all a little bit more impatient to get to the point. "Don't bother me with experimentation, just tell me what I need to know." I think that's borne out by the fact that the groundbreaking stuff we've seen published over the last 10 years is commercial, and has found a fan base. O: Then are you personally producing experimental works primarily to satisfy readers who are seeking out non-mainstream work, or to wake up readers who have become inured to a mainstream style? DE: Oh, that's a good question. Ooo, ooo. I don't know. To get interested in writing something myself, I have to look at it and say, "Okay, what's going to go on formally here that hasn't been done before? What can be done that would surprise people?" As a reader, I need to be surprised by every sentence. I don't want to read to just find out what happens. I need to have that pleasure in the words, then in the thinking behind them. So I have to approach it that way to get interested in writing, myself. In terms of what the priorities are, when I'm really being true to myself—a friend of mine recently said that no matter what he's writing, he always writes the book he would want to read. I think sometimes we forget that, and we try to think of what other people might want to read, or some sort of compromise between the two. I think that which is most artistically important and lasting are those things that are strange and new. Readers across the board are going to like a balance between "palatable" and "accessible." O: What about as a publisher? Are the books that you publish always the books you want to read? DE: That's harder, sometimes. We have published books that were not my favorite book of all time, but that somebody else in the office loved, or that I knew would have an audience, or that were by an author whose work I respect a lot, and who otherwise couldn't get published. Every so often, we will do that. I would prefer if everything we published was something I truly, deeply loved. O: In an interview about five years ago, you said that literary criticism comes from a "dank, dark place," and that book critics basically shouldn't be trusted. DE: Oh, who said that? [Laughs.] Oh man, if you're going to go back five years, I cannot vouch for anything I said. O: In that same interview, you talked about how much your attitude had changed from a few years previous, when you were a critic yourself. Has your perspective changed again? DE: It depends. I read our local book reviews, in The San Francisco Chronicle, which I think has a really excellent review section, and they bring attention to books that I otherwise would not have heard of. And that's what they should do. Writing about books should be celebrating writers who are unknown, should be explaining complex work, maybe, giving an entranceway or a gateway toward good readers who otherwise might not know how to approach a book. Everything that I read in terms of book reviews, I'd say 99.2 percent of it is great. It does exactly what it's supposed to do, and it's written by people who like to read, and want other people to read, that's what reviews should be doing. But I was indicting myself in that interview, because when I was a critic, I did a lot of art criticism, but I wasn't always writing from the artists' point of view. I was this young guy who didn't know anything about anything, and I remember writing annoying and ill-informed reviews of writers whose jock I would never have the right to hold or touch. So I was talking about myself. I'm never a fan of the sociopathic kind of reviewing, people who are sort of self-immolating and have social problems or whatever, and let it out in literary-criticism form. I just feel like book reviewing should be respectful and calm and not filled with bile. It's really hard to argue for a bile-filled review. But again, it's so rare, and there are only one or two people a year who produce that kind of thing. I think it's actually a very good time for book criticism right now. O: What if a book is ethically or morally or literarily suspect? Is there a place for a vitriolic review that's condemning the ideas rather than the writing? DE: I've thought a lot about this. That's a good question. What deserves that kind of bile that people throw out? Sometimes they throw it out at literary fiction, which is like dressing up in full body armor to go attack an ice-cream cone. I mean, just take it easy. [Laughs.] Back up, take a breath—it's a novel, you know what I mean? But I think that something like The Bell Curve is worthy of bile. I think that books like that need to be pushed down into the ground, lest they become dangerous. I think maybe a book celebrating Nazi poetry would deserve that kind of thing, or a rethinking of eugenics, or a defense of genocide. These kinds of books maybe deserve it when people get worked up. But otherwise, I think we should be able to talk about books without getting upset.